This week in PPS, we begin a new series I’m calling “Difference Makers,” interviews with people making a difference in the lives of youth. This week, I talked with Rob Ingram, director of the City of Portland’s Office of Youth Violence Prevention. We had a broad ranging talk touching on the Million Father March, Black Men Working, the success of students involved with SEI, the PPS high school redesign, and the over-representation of black men in Oregon’s criminal justice system. 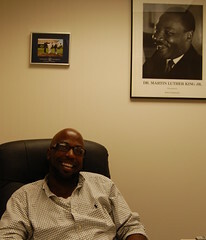 I caught up with Rob at his office in Northeast Portland.